Located three hundred metres from the Château de Boussu, with which it forms a seigneurial ensemble, this Romanesque chapel, restored in the 16th century in Gothic Hennesseau style, adjoins the Saint-Géry parish church. 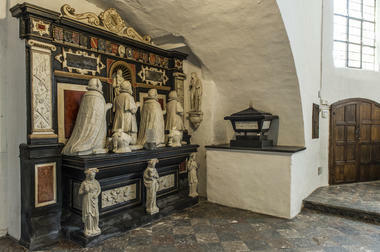 A true pantheon of local history for some, a shrine of the funeral sculpture of the Netherlands past for others, it has in its centre a vaulted crypt, in which are laid the various Seigneurs de Boussu of the Hennin, Liétard and Caraman families. 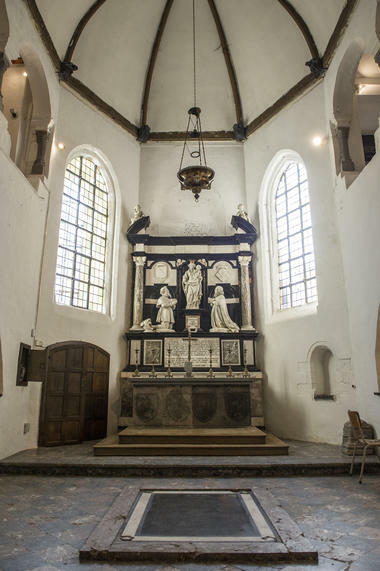 This listed edifice is on the list of Exceptional Heritage of Wallonia and contains the most beautiful set of Renaissance mausoleums in our country, including some of the works of the great Mons sculptor Jacques Du Broeucq. In the upstairs galleries, a museum of religious art has been set up.